A hedge trimmer or a shrub trimmer is a machine used for trimming, cutting and pruning shrubs and hedges. Hedge trimmers have been in use for centuries and with time, the machine has evolved, making it easy for you to transform your bushy lawn and garden into professionally kept ones without breaking a sweat. Hence, maintaining your garden becomes easy and you won’t feel the need to hire a gardener to do the job whenever there is a need. A variety of trimmers are available to choose from, depending on the kind of garden you have and the features that will suit it best. For example, some trimmers can help you get to hard-to-reach places without causing you to bend or lean over ladders, while some trimmers can be converted to chainsaws and some come with swappable heads. Each one is designed to help you for specific needs. To save you from wondering which hedge trimmer might suit you, we have listed the best ones for each type after carefully studying their functions, features, properties, cost and what kind of reviews they received. These hedge trimmers are usually for edges. For this trimmer, the task at hand will be far away from an electric supply, so you will need something that doesn’t hinder you. Cordless hedge trimmers come without a cord and are battery operated. 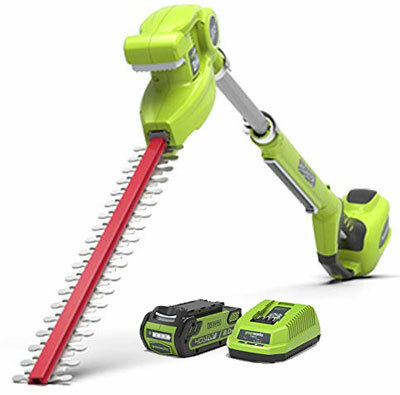 If you have a massive garden which isn’t covered by the range of your electric plugs or if you don’t want to trip and get tangled within power cables or fear them to get cut while you trim away your shrubs and hedges, this trimmer will be the best option. The cordless feature is not only handy but also cheaper than petrol and electric hedge trimmers. A variety of cordless hedge trimmers are available in the market. Below are a few of the best cordless hedge trimmers based on price, durability and efficiency. The B&D 36V hedge trimmer has won the title for excellency, affordability and being an all-rounder. It is equipped with anti-jam technology and comes with a 55 cm long dual blade. This makes it easy to snip thicker hedge branches and clear away the jam with just a simple press of a button. It possesses 22 mm gap between the blades, which helps cut up to 15 mm thick branches. Its battery timing is 50 minutes per a 90-minute charge. It is more suitable for trimming eye-level hedges and for cutting small and medium-sized hedges. It possesses a bale handle, which ensures better balance for vertical trimming. There is minimum load on the arms and back, which makes it easy to hold for a person of any build. As it is battery-operated, it comes handy for large gardens. There will be no cord to disrupt or limit the access to the task or be at risk to get cut. This product has garnered great favour from a lot of people, who are satisfied with its purchase and left positive reviews about how it tackles thick hedges effortlessly. It weighs 6.83 lbs. and a lithium-ion battery is included with it. The DeWalt DCM563PB-XJ comes with the advantage of being low maintenance and noiseless. It is the best one in its series and has been reviewed positively by many. Its 18V battery gives it the longest lasting battery time. It also comes with an indicator, which tells you when your battery is fully charged and how much battery time remains while you work. Its 55 cm dual-action laser-cut blades comes with a 19 mm gap between them. It can also cut branches as thick as 3/4 inches. The hard blades allow long-lasting sharpness and precision in cutting. It comes with an auxiliary handle, which makes the grip comfortable and makes it suitable for different trimming orientations. It possesses a removable cap to access the blades with ease and a gear to swap the blades. It has a 70-minute runtime per charge. It weighs 2.2 lbs. and comes with a lithium-ion battery. The Gtech HT20 is considered as the most versatile hedge trimmer. It is extendable and helps trim long branches without the use of a ladder. It is lightweight and possesses swappable blades to help cut 12.2-inch thick branches with neatness and precision. The head of the blade can rotate 135 degrees to allow flat cuts on the top of hedges. It gives a battery time of up to 45 minutes with a lithium-ion battery. It is easy to assemble and possesses four parts. It needs 18V power and weighs 5 lbs. (including the battery). This hedge trimmer is the best option when it comes to dealing with stubborn shrubs and thick hedges. With 3.6V battery power, it is lightweight at 1.2 lbs. and runs on lithium-ion batteries. It is powerful and possesses a multi-click system, allowing easy access to swap shrub and grass blades. Its multi-tasking features make it the best option for everyday gardening tasks. The battery life is up to 50 minutes per charge with a charge time of 3.5 hours. It has a 4-stage LED charge-level indicator to keep you aware of the charging state as well as how much battery time you have left. Its design is compact, thus making its handling easy and more comfortable. Makita DUH523Z provides the latest technology of hedge trimmer. If your tool creates noise that not only makes your ears bleed but also wakes up the whole neighbourhood, it is a big no-no. This hedge trimmer is well-known for its silent working. Its anti-vibratory design comes with 5 cushions within the motor housing to reduce the vibrations. Its 20-inch blade helps cut and trim the thickest branches. With a battery power of 18V, its motor capacity is 1350 SPM for a fast cutting process. It comes with the fastest charging time and runs up to 75 minutes per charge. It weighs only 7.2 lbs. (with the battery) and uses a lithium-ion cell. It also possesses a warning indicator. The motor turns off when the indicator light switches on to let you know that it needs to be recharged. The WORX WG259E is one of the most powerful hedge trimming tools when it comes to longevity. With a battery power of 18 volts, it stands on par with the best electric and gas hedge trimmers. It comes with a 20-inch blade and can cut 14 mm thick branches with ease. It is easy and comfortable to balance and operate. The blades are smooth, sharp and dual in action. The trimmer also comes with a blade tip protector to keep you safe from cutting anything unnecessary. It possesses a soft-grip rear handle and a D-shaped front handle for maximum comfort and control while cutting. The transparent hand-guard helps you keep check of your actions. It weighs only 7.7 lbs. A petrol hedge trimmer is a simple grass, shrub and hedge trimming machine which operates on petrol and gas. A wide variety of petrol hedge trimmers are available in the market varying according to use. The size of the petrol tank varies for small to large gardens and what kind of action is needed to be taken. Engine housing contains the engine, starting mechanism, switch, initial gearing mechanism and petrol tank made of either plastic or metal. The best ones are made of plastic because they don’t transfer heat and weigh less. Shaft delivers the energy of the engine to the rotating head of the cutting device. Shafts vary in length depending on the engine power and size of cutting area. Control handle fits on the shaft. The position is determined by the size of the user and the capacity of work. Handles can be removed for storage and portability. They are usually made of plastic. Rotatory head is a simple head that turns the engine and is usually made of impact-resistant plastic. The head contains cutting material and attachments for the cutter. Cutter is mostly plastic in nature to work through the thickness of hedges. As petrol is used, this type possesses more power than cordless and electric hedge trimmers. It is low maintenance and adaptable to a great variety of cutters. It comes with a 26-CC motor which gives high performance at a power of 600W and with a large cutting capacity. It possesses a 560 mm double-action blade, which can cut a branch and hedge up to 28 mm in diameter. It can perform 530 cuts per minute. The product comes with a blade cover to protect it from accidents and to promote safer storage. 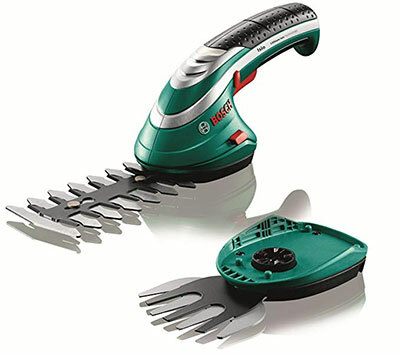 The rotating handles aid greatly in cutting and pruning. It weighs only 15.1 pounds. Manoeuvring it is easy with its innovative design and user-friendly technology. Since it operates on petrol, it is cordless and can be taken to remote places. The protecting hand-guard is to keep the branches from jumping toward the user. There is a safety operation switch that needs to be turn on to prevent accidental start-up, thus ensuring the safety of the user. The brand name is enough reason for you to choose it. This petrol trimmer is ideal for the gardens in front of your homes and offices. It possesses a 620 mm thick double-sided blade which ensures equal and balanced cutting. The input power of the engine is 21 CC, and the recorded speed is 10,000 cuts per minute. It weighs 16.4 lbs. A wide-angled adjustable handle makes it use and handling easy and comfortable. The blades of this trimmer possess three different cutting edges. Its exhaust is in the front to keep its direction away from the user. It possesses a “quick-switch” multi-position rear handle that turns at 180 degrees, which gives the handle good grip and ease of operation. Its fuel tank capacity is 1.2 litres and possesses a “spark plug” to start the engine. Its blades are hard and double-edged. The trimmer head is made of nylon. It can trim the hedges and branches with a 40 cm diameter. Its engine power is 33 CC. It comes with a centrifugal clutch, which engages automatically, enabling the tools to be driven when required. This is one of the best petrol hedge trimmers on the market. Its engine power is 26 CC, and it comes with a carburettor that starts easily in any weather. It is best for hedges with thick density and possesses 600 mm dual-action blades with a 28 mm tooth gap to achieve a clean and precise cut. It comes with a “hedge sweep attachment” to help get rid of clippings when needed. There is a revolving rear handle as well with five different positions that makes manoeuvring the machine easy. It is ideal for both domestic and professional use. Compact and lightweight, this trimmer is best suited for domestic purposes. This machine is noiseless, making it easy to use without disturbing your neighbourhood. It possesses features like Smart Start and Recoil Start to ensure a quick and easy operation. The machine is also equipped with an air purge system. It removes air from the fuel and carburettor, which makes this trimmer works efficiently. The anti-vibration dampers absorb the vibrations and make it comfortable to use without causing irritation to your hands and arms. It also possesses an adjustable rear handle, which makes it easy to cut the sides and top of your hedges. The twisting and swivelling ability of the rear handle makes manoeuvring the machine much easier for vertical cuts. Its blade is 60 cm long, which enables you to reach impossible spaces. It makes the cutting process easy. It possesses double-edged heavy-duty blades, which help achieve the desired task. It is made entirely of aluminium which makes it durable. It weighs 14.3 pounds, and its engine possesses a power of 600W which gives maximum output to the engine. Makita doesn’t need any introduction. It produces high-quality products, and this one has a mid to high-level hedge trimmer. Its blade is 560 mm long, which can cut hedges up to 12 mm in diameter with great ease. The blades are dual-action and double sided, which gives the finest results and can cut through anything. It is provided with a wide trigger control and soft handle for better and comfortable control. The engine is 24 CC and consists of a large fuel tank, which provides a nonstop output of energy, thus ensuring an interrupted period of work. It also possesses an anti-vibration system, which absorbs the vibrations and makes sure you don’t get tired and irritated while working. It is best suited for domestic and semi-professional purposes. The additional features include a spanner, a blade guard, safety googles and 10 ml of oil. There is nothing in particular about this hedge trimmer that could be considered a drawback. In all our test and in the experience of other customers, no cons have been found so far. The machine serves to its best. When you have tall hedges (like holly and boxwood), you need something more than just a normal trimming machine. Long-reach hedge trimmers are the best choice to keep tall hedges neat, tidy and well-kept. Long-reach trimmers can be cordless, corded/electric and petrol-operated. There are many brands that make more than one type of hedge trimmers, but it is important to note which long-reach hedge trimmer will suit you best. Below are the best long-reach trimmers that we shortlisted after careful study of their features and the reviews they received from those who used them. If you are looking for a professional-grade long-reach hedge trimmer that could extend and handle overgrown hedges at impossible heights, the DeWalt DCM586N is the best pick. With a battery power of 38V, it is equivalent to any petrol or electric hedge trimmer. The battery can last up to 90 minutes per charge with a charging time of 30 minutes. It requires low maintenance and makes very less noise, which makes it favourable for residential neighbourhoods. The length of the blade is 50 cm, which can cut a hedge with a thickness of 12 inches. It possesses a telescopic shaft that can reach up to 3 feet in compact spaces and can extend up to 5 feet when required without using the ladder. The blades are made of hard steel. Its 1-inch tooth gap makes trimming deadwood and thick hedges efficient and quick. Its additional features include a steel motor, a shoulder strap and an adjustable head with eight different locking positions. These enable the trimmer to reach difficult spaces and gives your work a professional touch. This product is new as compared to the others, but it has managed to attain a remarkable reputation in a short time. Greenworks has succeeded in making a battery-operated and an electric hedge trimmer. If you need a hedge trimmer for landscaping your garden that has tall hedges that need to be maintained with ease, this 20-inch long-reach cordless trimmer will be your best pick. With 40V of power, its battery functions for up to 50 minutes per charge with a charging time of 120 minutes. The blade is 20 inches long with a cutting capacity of 5/8 inches. Thus, it is not suitable for heavy and overgrown hedges. Its telescopic shaft can extend up to 6 feet. Flat tops and rounded or beveled edges all lie within its range and can be trimmed with great ease and precision. The additional features include a three-position pivoting head with different steel blades. The head can be locked in place. This feature along with a wide and easy grip gives access to different angles without sacrificing comfort or stability. This long-reach hedge trimmer is a great choice for having controlled precision over dense shrubberies. The Sun Joe SJH902E is one of the best choices to consider when it comes to buying a pocket-friendly hedge trimmer that can reach tall hedges and make their maintenance an easy task. It is corded since it runs on electricity and comes with a 4-amp motor with the added features of steel blades. Its pivoting heads are adjustable and give extra control for making precise cuts at impossible heights so that you can trim hedges just the way you want. The shaft is telescopic with a range of 7.9 feet without extension and can reach up to 13 feet in total. This makes it suitable for impossible heights. Thus, with this product, you can take care of dead branches and trim shrubs with great precision while your feet stay on the ground. Most Sun Joe long-reach hedge trimmers possess a small tooth gap and are precisely designed for lightweight jobs, which is what the SJH902E provides as well. Hence, it is suitable for regular maintenance, which makes it perfect for domestic purposes. The blades are 21 inches in length and can cut a hedge with a thickness of 2/3 inches. The trimmer works efficiently in compact spaces as well. When it comes to heavy-duty performance, the Poulan Pro 967089701 is the best choice. 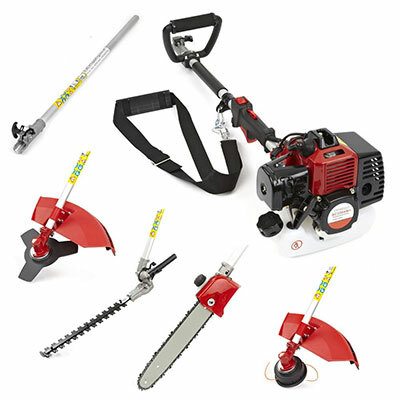 It comes with 6 different attachments, which means that with the same extension pole, you can perform six different tasks (which are edging, pruning, cutting, hedge trimming, shrub cutting and blowing). Its 25 CC gas-powered motor gives it enough energy to perform domestic chores. The cutting length of the blade is 15 inches. The tooth gap is only 5/8 inches, which suits residential trimming tasks the best. This hedge trimmer operated on gas and weighs 14 lbs. It comes with the added features of a spring assist pull and air purge, which extract the air from the carburettor, thus ensuring its longevity. The bar measures 8 inches in diameter and can extend the reach of the trimmer by up to 3 feet to reach a full 12 feet. As the name indicates, these hedge trimmers run on electricity. They might prove a little tricky to use as compared to battery-, petrol- and gas-operated hedge trimmers, but they do possess their own positive traits that make them reliable in a way that others don’t. Based on the study of various corded hedge trimmers and the positive feedback they received from users, below are the best electric hedge trimmers that you might want to consider for your lawn or garden. The Bosch AHS 70-34 is a highly robust and powerful hedge trimmer. With a motor power of 700W, it is highly suitable for large, stubborn hedges. It possesses a 70 cm laser-cut diamond-ground blade with a 34 mm tooth gap, which can cut a hedge measuring up to 34 mm in diameter. The added features include a blade tip protector to avoid the blade from wearing out. The design is ergonomic, which ensures that you get through the toughest jobs with great ease. Its comfortable handling enables you to work in any position to cut with great precision. The B&D GT6060 is user-friendly and comes with 600W power to provide 1960 strokes/min. It comes with the safety of a two-handed starting switch, which means it cannot be accidentally turned on. Its 60 cm blade can cut through medium-sized hedges having a diameter of 25 mm with great precision. It is lightweight but sturdy and works fast with fine and neat results. Its body design and handle are made to provide maximum comfort with an even weight distribution while in use. The blades are asymmetric and dual in action, which reduce the vibrations to give extra ease and security while using it. A wide protective guard shields the user from debris. The Toro 51490 Corded Hedge Trimmer is designed to get the job done more quickly and easily. Its design is ergonomic with durable features that provide great precision without tiring you out. Its 4-amp motor is equipped with a 22-inch cutting blade that can cut through 9/16-inch thick branches with neatness and ease. The blade is made of hard steel which is dual in action. Its handle provides a work grip and possesses a dual-action function to help reduce the vibrations and prevent the arms and muscles from tiring out. Its cord-lock system prevents the cords from getting disconnected. This trimmer is designed for messy and overgrown hedges. The 650W Ryobi RHT6560RL comes with a 60 cm blade that can cut a hedge with a diameter of 30 mm. The blade is dual in action and made of diamond ground that gives a fine finishing while cutting. It absorbs the vibrations so that the user can perform the task without tiring out their hands and arms. Its GripZone handle ensures that even the tallest hedges and branches are trimmed properly without compromising the comfort and safety of the user. It possesses a light indicator as well which turns on when the cord is plugged into the main so that the user can be informed when the trimmer is working. We have given you a brief review about the best hedge trimmers in different categories, which should help you make your pick. Every type of hedge trimmer has its own plus points and drawbacks. What is suitable for your friend might not be great for you. Some might prefer a battery-operated cordless hedge trimmer, while some will choose a corded one. In the end, it all comes down to your preferences and requirements. You should know which type is most suitable for you before you start looking at products. It is important to note which material is used in the construction of the trimmer. This is not just restricted to the appearance but extends to the working mechanism as well. Know your product inside out before buying it. Some are available in metal, some in plastic and some in a mixture of both. Know which material can give you better and long-lasting benefits before investing in one. Budget is the most important thing to consider when it comes to making a purchase. Before you decide to get something, you need to set a price range for it. You also need to know what features you will get for the price you are paying. Does the trimmer come with spares or will you have to pay extra for them? Many battery-operated cordless trimmers come without a battery, which you would have to buy separately. This will end up increasing the price of the actual product. Hence, don’t forget to check what you will be getting for the price. Every hedge trimmer differs in size and weight. Their size may or may not have a direct link to their performance since there are many small trimmers that offer a better operation than the big and heavy ones. Make sure you know what size you want. You can decide this based on what you need it for, whether it is for residential or commercial uses and whether it’s for small or large spaces. The added features are the cherry on top. Not many will have them, so you will have to be very thorough in your search if you want certain features. Every product comes with its positives and negatives, but how it suits your needs is what makes that product great. The hedge trimmers mentioned above are just a few out of the many available in the market that are chosen or preferred over other hedge trimmers because of the advantages and level of ease they provide to their users. Your choice might be completely different from our top picks based on what you prioritise. Battery and petrol hedge trimmers might be most preferable since they don’t have a cord that will disrupt or hinder their use. However, that might not be the case for everyone. There are tons of features that a corded/electric hedge trimmer would provide that a battery and petrol trimmer won’t. All in all, the final decision lies in your preferences and requirements. Only you know best which trimmer will suit your work style and comfort.